Our Care Home Bedroom Furniture range includes bedroom units, drawers, dressing tables, wardrobes, memory boxes and more. 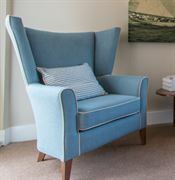 All furniture is available in a variety of fabrics and finishes therefore regardless of the décor we have the perfect solution for your care home bedroom. With 50 years’ experience, we can ensure that all care home bedroom furniture designed and created here at Renray is of the highest quality.